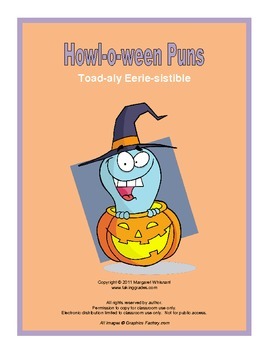 Howl-o-ween Puns is mostly for fun, but learning is also an intended benefit in this free download. Students are instructed to check out the condition of their punnybones by reading Halloween-related riddles and spotting the pun in the collection of possible answers. Halloween Puns has two different sets of riddles with 25 items each for students to sink their teeth into. For teachers, I have added an extra page of Halloween riddle-puns and a second page of anytime-puns that can be used to construct another lesson or two. Full answer keys are included. Eight total pages counting cover page.